Radio Massacre International comprises Steve Dinsdale (Keyboards, Electronics, Drums) Duncan Goddard (Keyboards, Electronics, Bass) and Gary Houghton (Guitar, Keyboards). Since 1993 they have been building a catalogue of epic electronic improvisations, distilled into permanent records by the wonders of digital editing. After accumulating a library of 30 such pieces they finally released the double CD Frozen North in late 1995, and appeared live for the first time at the Emma festival in Sheffield. 1996 saw them catapulted to European TV fame when they co-hosted the dance orientated 'Party Zone' on MTV, where they distinguished themselves by playing a live piece that did not contain a single discernible beat. The same month, they were the first electronic artists to play at England's famous Jodrell Bank observatory, in the shadow of the mighty radio dish. A second album of extended improvisations Republic and the live Knutsford In May were followed by the more concise Organ Harvest which was launched at the 1997 Klemdag festival in Nijmegen, Holland in front of the band's largest live audience to date. This year also saw the initiation of a series of CDR private releases in order to keep pace with their prolific output. Flushed by their European success the band recorded the sequencer and atmospherics album to end them all in the massive 1998 double CD Borrowed Atoms (supplemented by a further CD-R Bothered Atmos from the same sessions, these 200 minutes still stand as an early career peak). The millennium year brought appearances at the Alfa Centauri festival in Holland, and another visit to Jodrell Bank. The band's music was also featured in a BBC-TV programme 'Don't Look Down' about the 300 foot radio telescope. A further live album (Upstairs Downstairs) and a couple of long overdue archive releases (The God Of Electricity and Zabriskie Point) rounded off the year. In 2001 the band was instrumental in the founding of the Hampshire Jam concerts in southern England, highlights of which appeared on the various artists CD 'Hampshire Jam Preserved'. The studio album Planets In The Wires was the first on their own Northern Echo label and gathered many plaudits for its fresh approach to darker improvisational electronics, and almost neo-classical sonorities. 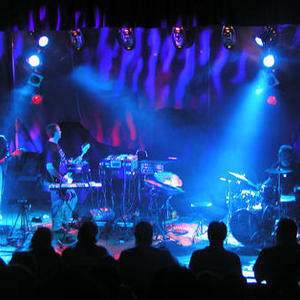 In November 2002, RMI played their first dates in the United States. In California they headlined the first night of the Progwest Festival, and appeared live on Radio KXLU in LA. Over on the East coast they addressed The Gathering at St Mary's Church in Philadelphia before improvising a marathon two and a half hour piece live on Star's End on Radio WXPN the same night. Highlights from this, their first US sojurn, are to be found on the double CD Solid States. Intensive preparation sessions for the above live appearances integrated acoustic drums and electric Bass into the RMI palette, and 2003 saw them return to the concert stage in the UK and Europe with a debut performance at the National Space Centre in Leicester, and successful slots at the E-Live Festival in Eindhoven, Holland and the Virtaa Arts Festival near Helsinki, Finland in early 2004 alongside starkly different but complimentary acts. The Finnish gig was later immortalized on Walking On The Sea released in May 2004. Incorporating elements of Prog/Krautrock into their more established electronics they continued to broaden their horizons, (and test their fans' loyalties) by playing on any festival bill regardless of genre. Taking this approach to a logical conclusion they largely abandoned the electronics for a one off 100% improvised Guitar/Bass/Drums set with legendary Can guru Damo Suzuki on vocals in Manchester, UK in March 2004. Suzuki's influence had reverberated around the city for many years through Buzzcocks, The Fall, & Happy Mondays, and a packed venue saw a night to remember for all concerned. The USA beckoned once more in May 2004 where the band made a return visit to The Gatherings concerts in Philadelphia, and recorded a new session for Chuck Van Zyl's 'Star's End' radio show. After meeting Cuneiform Records supremo Steve Fiegenbaum in Philly, RMI recorded an album Emissaries for the label, released May 2005. In collaboration with artist Matt Howarth, it features his original story and artwork available on enhanced CD. Between 2003-6, they gave annual performances at the UK National Space Centre, performing with guest artist Ian Boddy on the last of these occasions in March 2006. RMI released the Septentrional CD on Boddy's DiN label, with Boddy treating and remixing the material. This album was promoted with a syndicated ..living room concert??? for long running US radio show ..Echoes???. In December 2006, they finally released the long awaited 6 CD compilation Lost in Space, a career retrospective but containing entirely unreleased studio material from 1987 to 2003. September 2007 saw the release of a second Cuneiform album Rain Falls in Grey, their way of saying goodbye and thanks to Syd Barrett. The cover art for this release was drawn by the legendary Daevid Allen and the album featured contributions from UK reeds man Martin Archer and American Electric Violinist Cyndee Lee Rule. The album was launched with a concert at the Y Theatre in the UK featuring Archer, followed by a November visit to the U.S. where the band performed a run of radio sessions and concerts. A completely improvised Gatherings concert in Philadelphia was among the band?? ?s best all time performances, and a full blown band set at Orion Sound Studios in Baltimore saw them deliver the new album augmented by Cyndee Lee Rule and NYC reeds maestro Premik Russell Tubbs to fantastic response.